Portugal recently obtained four days’ worth of electricity from hydropower dams, wind turbines, cultivated biomass, and other renewable sources. That’s after the small Iberian nation got 62 percent of its electricity from renewables in 2014, winning praise from the International Energy Agency. Does this mean Portugal can be a model for the United States? The answer is no. First, while hydropower supplies 31 percent of Portugal’s electricity, and much larger shares of total generation in Washington, Oregon, and Idaho, it is only 6 percent of U.S. electricity nationwide. Most U.S. states simply do not have the required geography and meteorology for large-scale hydropower, and many activists oppose new hydro projects due to their impacts on land use and wildlife. Second, Portuguese electricity rates are twice as high as those in the U.S., and Portugal must raise rates even higher to pay off multi-billion dollar debts from years of subsidizing renewable electricity. But isn’t government support for renewables a potent economic stimulus? Economic data suggest otherwise. Portugal’s youth unemployment rate is 30 percent—among the highest in Europe. During 2000-2014, Portugal’s economy grew by only 1 percent—the lowest growth rate of any European country. A study of Spain’s renewable subsidies found similarly dismal results. By raising other industries’ production costs, Spain’s forced investment in renewables destroyed 2.2 jobs for each “green” job created. Renewable energy policies fleece consumers throughout Europe. Manhattan Institute scholar Robert Bryce finds that European residential electric rates increased by 63 percent on average during 2005-2015—78 percent in Germany, 111 percent in Spain, and 133 percent in the UK. Germany’s rate of 40 cents per kilowatt hour is more than three times the U.S. average of 12.5 cents. 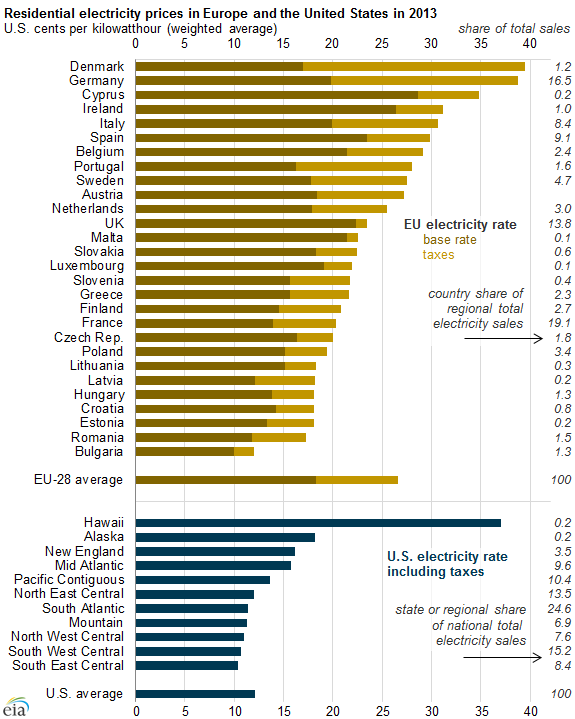 European manufacturers take big hits too, paying twice as much for electricity than their U.S. competitors. They also pay four times more for natural gas, a key source of industrial heat and chemicals, because several European countries ban or severely restrict hydraulic fracturing. But at least subsidizing renewables mitigates anthropogenic global warming, right? That is unclear. Europeans increasingly import energy-intensive goods they can no longer afford to produce at home. When we factor in the greenhouse gas emissions “embedded” in imported goods, Europe’s emissions are much higher than official estimates indicate. Technological advances are rapidly decreasing the cost of wind and solar power. Nonetheless, electricity from existing coal and natural gas power plants remains substantially cheaper than electricity from new wind and solar units. Forcing fossil-fuel power plants to shut down before the end of their useful life is a bad bargain for consumers. Note also that standard cost comparisons don’t take into account the lower value of unreliable power, the transmission infrastructure required to connect suitable solar and wind collection sites to distant population centers, and the fossil fuel units that must be built—and run inefficiently, at a loss—to backstop renewables when the wind isn’t blowing or the Sun isn’t shining. Tellingly, even after being propped up by politically mandated production quotas in 29 states, U.S. capital investment in wind and solar plummets each time targeted tax breaks for the facilities expire. What about renewables’ use in transportation? The Environmental Protection Agency’s Renewable Fuel Standard (RFS) program forces refiners to blend billions of gallons of biofuel—chiefly corn ethanol—into the nation’s motor fuel supply each year. Ethanol manufacture causes more air and water pollution than the gasoline it replaces, and potentially more greenhouse gas emissions as well. The RFS inflates grain prices and decreases motor vehicle fuel economy, costing consumers tens of billions of dollars annually in higher food and fuel costs. To make renewables more “competitive,” climate campaigners demand aggressive measures to restrict the production, transport, and consumption of fossil fuels. That is a recipe for energy shortages, economic stagnation, and even humanitarian disaster. Globally, renewable sources for power generation and transport increased by 330 percent during 2004-2014, yet renewables still provided only 3 percent of global energy consumption in 2014, according to the BP Statistical Review of World Energy. 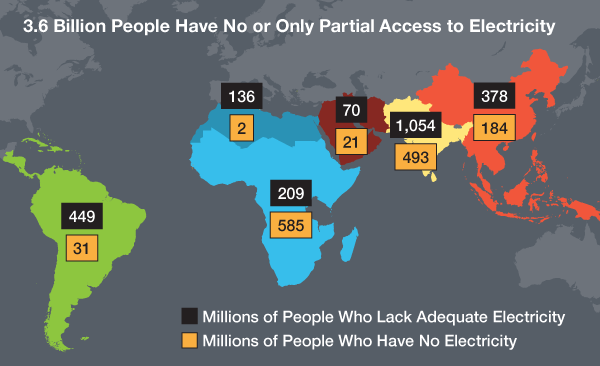 More than 1 billion people in poor countries have no access to electricity, and billions more have too little commercial energy to support development. Their most pressing need is not for low-carbon energy but for affordable and reliable energy. For the foreseeable future, abandoning fossil fuels would mean putting an energy-starved world on an energy diet. Originally posted at Inside Sources.